Good Show Sir Comments: Our winning (only) entry for Talk Like a Pirate Day! Thanks to Mitch for sending it in. No, no, it’s The Space Pilot! If you want to be taken seriously as a Space Pirate, purple novelty goggles are perhaps not the wisest choice. Also, might be an idea to invest in a Futuristic Ray Gun that doesn’t bend. Is the space pirate called Toby. Because that be a fine name for a pirate of the nautical persuasion. For a space pirate not so much. Walking the plank on a low-gravity desert asteroid isn’t quite as big a threat. @THX (1)—I think we’ve posted the Chinese GSS version of The Space Pilot. @B.Chiclitz #8 – Good Show Slur! 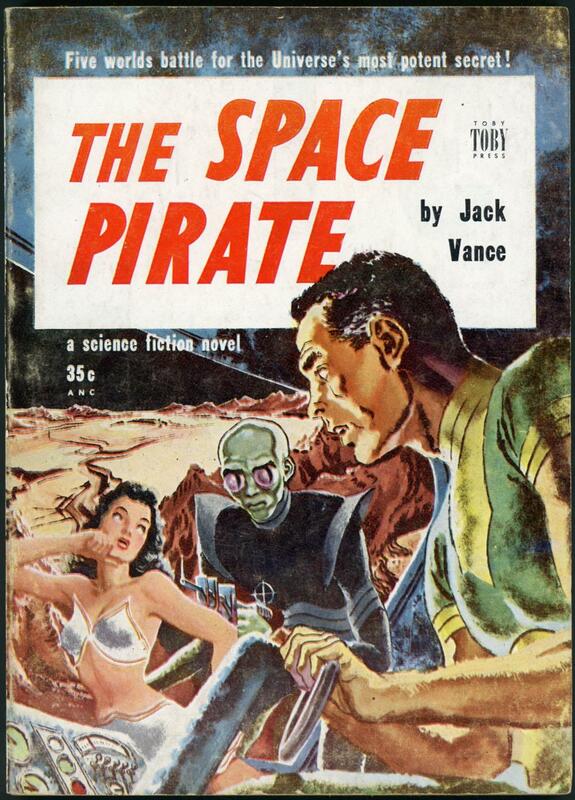 It’s a shame that the cover artist, despite going cheesy as all get out, didn’t bother to go with the expected imagery for a book called The Space Pirate. I mean, I guess the green guy is the pirate, but how do we know that for certain? And regarding the damsel, that is some mighty odd underwear she’s got herself captured in. That bra doesn’t appear to have any supports at all! At first I thought the Earthman was looking through a vehicle’s windshield/windscreen at the alien and the woman outside. But note the space between the Earthman and the alien. It shows that the alien and the woman are inside the vehicle. Which makes me wonder where the alien’s lower body is. Is the blue object at the front his right leg stepping way, way forward? And if it is his leg, what is the Earthman’s right hand doing? I also thought that the Earthman was operating a vehicle control device with his left hand, but it’s not connected to anything. Maybe it’s some sort of wireless mouse … of the future! Question: What does a pirate say on his 80th birthday? @Anna T.: The green guy is more a highwayman, albeit robbing golf-carts. I suppose ‘stand and deliver’ makes more sense on a planet with gravity and a flat surface. Is the Universe’s most potent secret how to undo a bra one handed? Are we sure the girl’s a girl and not the over-sized figurehead for a very small privateer? The lady in the space-bra doesn’t look very convincingly menaced. “The” space pirate? There’s only one? Not a very pulpy future. Yaarrrr. Is this a hostage situation? Judging by the look on yon wench’s face, it seems more of a roleplaying thing. “Ooh, Mr. Alien, you’re so big and strong, and you have SUCH a big ray gun, what will poor little me do?” And the guy in the spandex t-shirt is shocked by this. Is the green alien or the guy in the machine-that-makes-no-sense The Space Pirate? Or is The Space Pirate Sir Not Appearing on this cover? The alien is totally copping a feel.